Welcome to Brea Tile Cleaning, Established in 1998, Eco Green Brea Tile Cleaning, Repair, Water Damage is the first and best Environmentally conscious steam cleaning company in Orange County, CA. We are fully Licensed, Trained and Certified. From our GREEN-SEAL Certified Premium Cleaning Products to our sustainable dumping practices, Eco Green Brea Tile Cleaning Repair & Wtaer Damage Restoration uses ONLY Ultra-Premium cleaning products that possess far superior cleaning capabilities, are non-toxic, Bio-Degradable, non-irritant and safer for environmental disposal. Welcome to Eco Green Brea Tile Cleaning, Repair, Water Damage Established in 1998, Eco Green Brea Tile Cleaning, Repair, Water Damage is the first and best Environmentally conscious steam cleaning company in Orange County, CA. We are fully Licensed, Trained and Certified. From our GREEN-SEAL Certified Premium Cleaning Products to our sustainable dumping practices, Eco Green Brea Tile Cleaning Repair & Wtaer Damage Restoration uses ONLY Ultra-Premium cleaning products that possess far superior cleaning capabilities, are non-toxic, Bio-Degradable, non-irritant and safer for environmental disposal. Do you have tile flooring in the hallway, kitchen, foyer, or bathrooms? Has the grout turned dark with grit and grime? Over time grout can become a very dangerous breeding ground for mold, mildew and harmful bacteria. In general, tile floors in Brea should be professionally cleaned every two years. At Eco Green Brea Tile, Grout and Stone Cleaning, we utilize special equipment designed to safely and efficiently remove mold and mildew from grout and floors in Brea, CA. Our sophisticated products break right through the grime and grit. DOES ECO-GREEN Brea USE STEAM CLEANING OR DRY CLEANING? Eco Green Brea Tile Cleaning uses ONLY Hot Water Steam Extraction, with Advanced Tile Cleaning Products, followed by a No Residue Tile Fiber Rinse, the most comprehensive and results-driven method of cleaning. High Pressure Steam Cleaning with 235 degree Steam, in combination with the best Tile cleaning products is the ONLY method that successfully removes ALL of the soap and dirt from Tiles that Dry Cleaning and other Steam Cleaners leave behind. Simply stated, the technology is NEWER, SAFER and FAR more effective at both emulsifying and releasing ground in traffic lanes, dark oily spots from Tiles, pet stains, odor and Tile discoloration caused by food and drink spills. Unfortunately some Tile Cleaners use the weaker, outdated and more harmful, “Dry Cleaning” processs, which often leaves copious amounts of soap in the Tile, thereby causing sticky residue that actually attracts more dirt! At Eco-Green Newport Beach Tile Cleaning, we use only State-of-the-Art Tile Steam Cleaning machines and products that leave absolutely no trace of soap behind, leaving your Tiles cleaner, and keeping them in good condition longer. 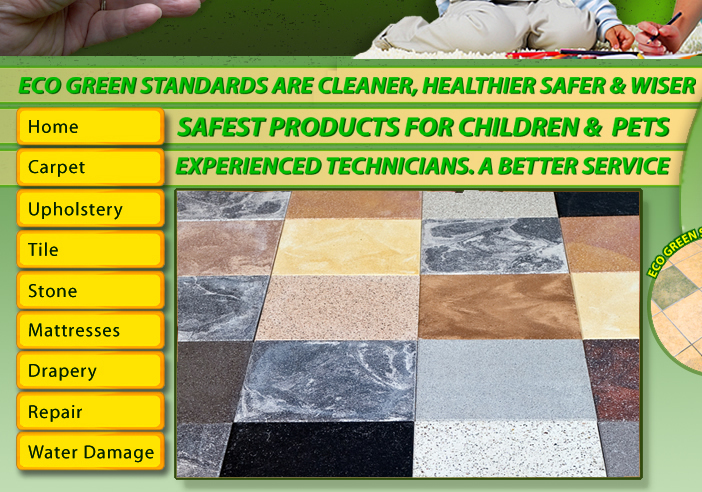 Eco Green Brea Tile Cleaning uses only products that meet the Tile and Rug Institute , or CRI, Green Seal of Approval for being Non Toxic and posing a Zero Health Risk. FACT: ALL Tile Cleaning products contain some form of chemicals. Anything else is simply not true. The difference is we use Ultra-Premium Products, which also happen to surpass the Green Seal of Approval by the Tile and Rug Institute. WHAT ARE ECO-GREEN Tile CLEANING PRODUCTS? 1) Biodegradable: All of our Tile cleaning products are fully biodegradable. They do not contaminate the ocean or drinking waters. This is possible because the solvents we used are citrus based dry solvents and do not contain lingering chemical compounds. 2) VOC Compliant: None of our Tile cleaning products contain kerosene, or other ethanol compounds, harmful to the environment and highly toxic to breathe. In fact, California law prohibits all Tile Cleaners from using these chemicals and they are not sold in California. 4) Health Hazard Score ZERO: Score a Zero out of possible Four, in diluted form, for the Health Hazard rating. As with all Professional-Grade Tile Cleaning Products, a chart demonstrating the Health hazard rating MUST be displayed. ALL of our products score a 1 out of 4 or LESS in concentrated form and a 0 out of 4 in ready-to-use potency. For the past thirty years, Dry Cleaning was very popular, however that method leaves extraordinary amounts of both dirt and soapy chemical residue in the Tiles, causing the spots to return after a short period of time and sometimes causing harmful skin irritations or toxic fumes. The reason that Dry-Cleaning methods are no longer recommended is because they do not actually use vacuums, but rather Dry Cleaning (you know the companies) use high speed spinning pads to supposedly “collect” the dirt and soap. However, there is absolutely no extraction of soap OR dirt out of the Tile, leaving toxic soap and dirt in the Tile. Essentially, soap that is left in Tiles attracts new dirt. Therefore, Dry Cleaning or Steam Cleaning without using a LOW pH Rinse, causes the soapy areas, those which were the dirtiest to begin with, to become dirty again in a shorter period of time because there is no soap removal. Even steam cleaners, who do not use the LOW pH FIBER RINSE, are not getting all of the soap out of the Tile and leaving a toxic, irritant and dirt-attracting high pH residue. New ZERO Residue technology is the most preferred method and our clients agree. We use a special RINSE that completely removes residue, soap and dirt, leaving the Tiles fluffier and softer than ever! High-Powered Equipment means fast dry times. Our products are the Safest and most Effective on the market today. We use the latest in hot water steam extraction technology, the only method recommended by the largest Tile manufacturers. Deep cleaning technology dissolves and lifts away dirt, grease and allergens that hide in your Tiles. We leave your Tile looking clean and refreshed. Even the smallest amount of flooding from an overflowing appliance or a leak can cause a great deal of damage to your home. Our professional Water Damage Restoration system removes all types of damage causing moisture quickly and effectively. We’re available 24 hours a day to rescue your Tiles from flooding and water damage. 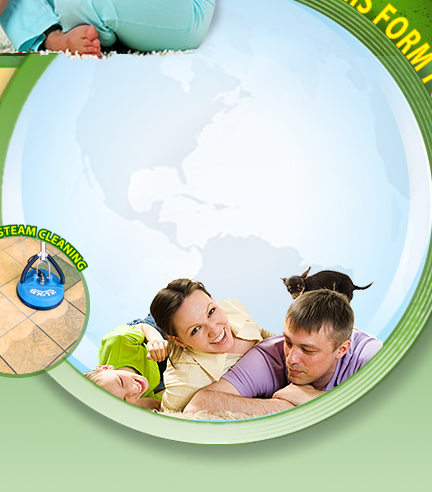 We use the most highly rated professional products that sanitize your pet stained Tiles and leave them smelling fresh. Our professional strength Tile cleaning process helps prolong the life of your furniture by extracting dirt and soil from the Tile fabric. By having your Tile professionally cleaned on a regular basis you eliminate dirt particles that cause wear and tear on the fabric. Regular professional cleaning also removes allergens trapped in the fabric. Our high pressure extraction system is the only one recommended for removing mold and mildew that thrive in your Tiles. Regular professional cleaning dissolves away mold and mildew causing bacteria and the musty odors they generate. Your Tile came with a coat of protectant when it was new. After years of cleaning and daily foot traffic, that protection has been worn away. We’ll reapply a fresh coat of Teflon or ScotchGuard to help your Tiles resist stains as well as daily wear and tear.